Using the ESO Very Large Telescope (VLT) , two astronomers from Germany and the UK  have discovered some of the most distant galaxies ever seen. They are located about 12,600 million light-years away. It has taken the light now recorded by the VLT about nine-tenths of the age of the Universe to traverse this huge distance. We therefore observe those galaxies as they were at a time when the Universe was very young, less than about 10% of its present age . At this time, the Universe was emerging from a long period known as the "Dark Ages," entering the luminous "Cosmic Renaissance" epoch. Unlike previous studies which resulted in the discovery of a few, widely dispersed galaxies at this early epoch, the present study found at least six remote citizens within a small sky area, less than five per cent the size of the full moon! 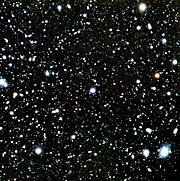 This allowed understanding the evolution of these galaxies and how they affect the state of the Universe in its youth. In particular, the astronomers conclude on the basis of their unique data that there were considerably fewer luminous galaxies in the Universe at this early stage than 500 million years later. There must therefore be many less luminous galaxies in the region of space that they studied, too faint to be detected in this study. It must be those still unidentified galaxies that emit the majority of the energetic photons needed to ionise the hydrogen in the Universe at that particularly epoch. Nowadays, the Universe is pervaded by energetic ultraviolet radiation, produced by quasars and hot stars. The short-wavelength photons liberate electrons from the hydrogen atoms that make up the diffuse intergalactic medium and the latter is therefore almost completely ionised. There was, however, an early epoch in the history of the Universe when this was not so. The Universe emanated from a hot and extremely dense initial state, the so-called Big Bang . Astronomers now believe that it took place about 13,700 million years ago. During the first few minutes, enormous quantities of protons, neutrons and electrons were produced. The Universe was so hot that protons and electrons were floating freely: the Universe was fully ionised. After some 100,000 years, the Universe had cooled down to a few thousand degrees and the nuclei and electrons now combined to form atoms. Cosmologists refer to this moment as the "recombination epoch" . The microwave background radiation we now observe from all directions depicts the state of great uniformity in the Universe at that distant epoch. However, this was also the time when the Universe plunged into darkness. On one side, the relic radiation from the primordial fireball had been stretched by the cosmic expansion towards longer wavelengths and was therefore no more able to ionise the hydrogen. On the contrary, it was trapped by the hydrogen atoms just formed. On the other side, no stars nor quasars had yet been formed which could illuminate the vast space. This sombre era is therefore quite reasonably dubbed the "Dark Ages" . Observations have not yet been able to penetrate into this remote age - our knowledge is still rudimentary and is all based on theoretical calculations. A few hundred million years later, or at least so astronomers believe, some very first massive objects had formed out of the huge clouds of gas that had moved together. The first generation of stars and, somewhat later, the first galaxies and quasars, produced intensive ultraviolet radiation. That radiation could not travel very far, however, as it would be immediately absorbed by the hydrogen atoms which were again ionised in this process. The intergalactic gas thus again became ionised in steadily growing spheres around the ionising sources. At some moment, these spheres had become so big that they overlapped completely: the fog over the Universe had lifted! This was the end of the Dark Ages and, with a term again taken over from human history, is sometimes referred as the "Cosmic Renaissance" . Describing the most significant feature of this period, astronomers also call it the " epoch of reionisation ". To cast some light on the state of the Universe at the end of the Dark Ages, it is necessary to discover and study extremely distant (i.e. high-redshift ) galaxies. 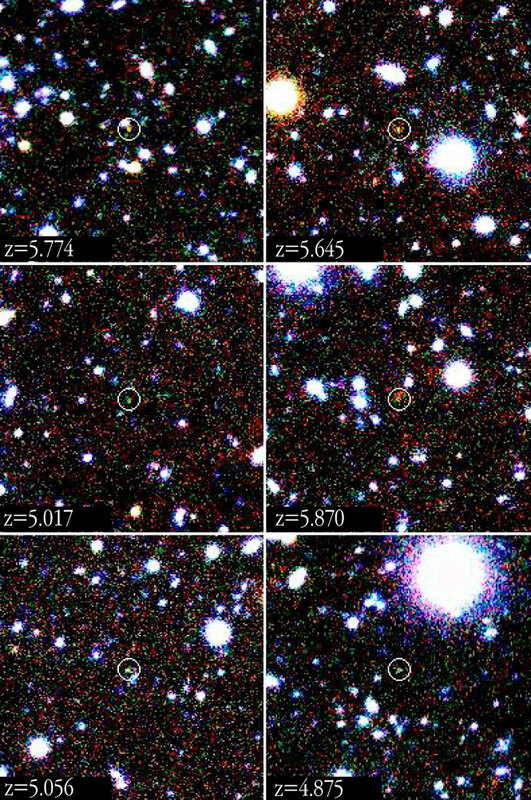 Various observational methods may be used - for instance, distant galaxies have been found by means of narrow-band imaging, by use of images that have been gravitationally enhanced by massive clusters, and also serendipitously. Matthew Lehnert from the MPE in Garching, Germany, and Malcolm Bremer from the University of Bristol, UK, used a special technique that takes advantage of the change of the observed colours of a distant galaxy that is caused by absorption in the intervening intergalactic medium. Galaxies at redshifts of 4.8 to 5.8  can be found by looking for galaxies which appear comparatively bright in red optical light and which are faint or undetected in the green light. Such "breaks" in the light distribution of individual galaxies provide strong evidence that the galaxy might be located at high redshift and that its light started on its long journey towards us, only some 1000 million years after the Big Bang. For this, they first used the FORS2 multi-mode instrument on the 8.2-m VLT YEPUN telescope to take extremely "deep" pictures through three optical filters (green, red and very-red) of a small area of sky (40 square arcmin, or approx. 5 percent the size of the full moon). 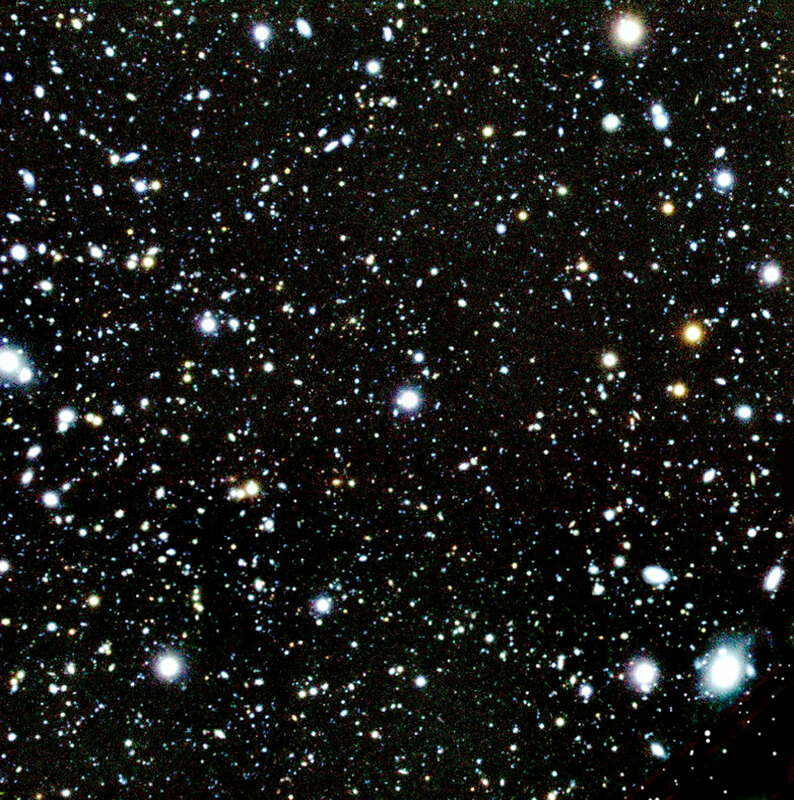 These images revealed about 20 galaxies with large breaks between the green and red filters, suggesting that they were located at high redshift. Spectra of these galaxies were then obtained with the same instrument, in order to measure their true redshifts. "The key to the success of these observations was the use of the great new red-enhanced detector available on FORS2", says Malcolm Bremer . 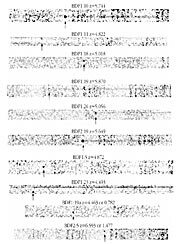 The spectra indicated that six galaxies are located at distances corresponding to redshifts between 4.8 and 5.8 ; other galaxies were closer. Surprisingly, and to the delight of the astronomers, one emission line was seen in another faint galaxy that was observed by chance (it happened to be located in one of the FORS2 slitlets) that may possibly be located even further away, at a redshift of 6.6. If this would be confirmed by subsequent more detailed observations, that galaxy would be a contender for the gold medal as the most distant one known! The spectra revealed that these galaxies are actively forming stars and are probably no older than 100 million years, perhaps even younger. However, their numbers and observed brightness suggest that luminous galaxies at these redshifts are fewer and less luminous than similarly selected galaxies nearer to us. "Our findings show that the combined ultraviolet light from the discovered galaxies is insufficient to fully ionise the surrounding gas", explains Malcom Bremer. "This leads us to the conclusion that there must be many more smaller and less luminous galaxies in the region of space that we studied, too faint to be detected in this way. It must be these still unseen galaxies that emit the majority of the energetic photons necessary to ionise the hydrogen in the Universe." "The next step will be to use the VLT to find more and fainter galaxies at even higher redshifts", adds Matthew Lehnert. "With a larger sample of such distant objects, we can then obtain insight into their nature and the variation of their density in the sky." The observations presented here are among the first major discoveries by British scientists since the UK became a member of ESO in July 2002. Richard Wade from the Particle Physics and Astronomy Research Council (PPARC), which funds the UK subscription to ESO, is very pleased: " In joining the European Southern Observatory, UK astronomers have been granted access to world-leading facilities, such as the VLT. These exciting new results, of which I am sure there will be many more to come, illustrate how UK astronomers are contributing with cutting-edge discoveries." : This is a coordinated ESO/PPARC Press Release. The PPARC version of the release can be found here. : This work was carried out by Malcolm Bremer (University of Bristol, The United Kingdom) and Matthew Lehnert (Max-Planck-Institut für Extraterrestrische Physik, Garching, Germany). 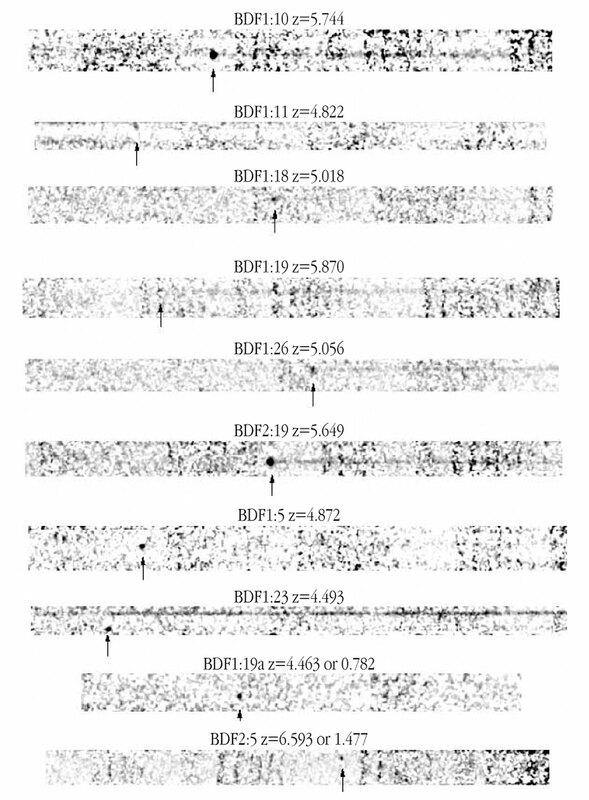 : The measured redshifts of the galaxies in the Bremer Deep Field are z = 4.8-5.8, with one unexpected (and surprising) redshift of 6.6. In astronomy, the redshift denotes the fraction by which the lines in the spectrum of an object are shifted towards longer wavelengths. The observed redshift of a remote galaxy provides an estimate of its distance. The distances indicated in the present text are based on an age of the Universe of 13.7 billion years. At the indicated redshift, the Lyman-alpha line of atomic hydrogen (rest wavelength 121.6 nm) is observed at 680 to 920 nm, i.e. in the red spectral region. The results described in this Press Release are about to appear in the research journal Astrophysical Journal (" Luminous Lyman Break Galaxies at z>5 and the Source of Reionization" by M. D. Lehnert and M. Bremer). It is available electronically as astro-ph/0212431 . ESO Press Photo eso0326 is reproduced from FORS2-exposures, obtained on June 17, and July 6, 7, and 12, 2002, using 3 broad band filters (R, I, and z with peaks at 650 nm, 780 nm, and 910 nm, respectively). The total exposure time was 2.6 hours in R, and 1 hour each in I, and z. The field-of-view of the final image is 6.4 x 6.4 arcmin 2, corresponding to about 1 Mpc on each side at a redshift of 5.3. The frames were obtained in photometric conditions, and the image quality in the combined frame is 0.7 arcsec. 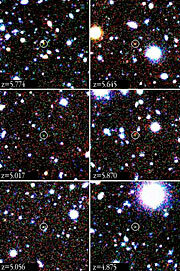 The images shown in ESO Press Photo eso0326 are similar to ESO Press Photo eso0326 but now only showing the regions around 6 high redshift galaxies. The galaxy spectra shown in ESO Press Photo eso0326 were obtained by FORS2 in the MXU-mode on August 6 and 8, 2002. Exposures of 4 1/3 hours were made through two masks under photometric conditions, with seeing 0.7 arcsec and slit sizes of 1 arcsec. The 300I grism was used; it has peak efficiency of about 70% and a resolution R = 600 at 800.0 nm.